What I like about Scott McCloud’s definition of a comic is that it’s very broad now. So I do think that my comic indeed fits the definition of comics by Scott McCloud because my comic is a set of juxtaposed images in a deliberate sequence. It goes from panel to panel flowing nicely through with the images telling somewhat of a small story. One of the concepts discussed in Scott McCloud’s book which influenced my comic was the one about time frames. He talks about how in a comic each frame can be told from a different time in the story even though on the page they are next to each other. 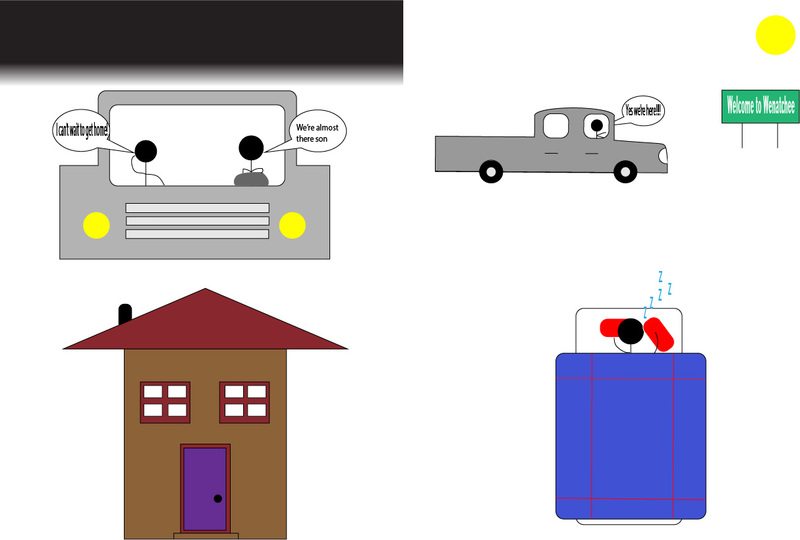 I used this concept because in my comic it shows that time is moving quickly with driving the truck on a road trip in the beginning of the comic to then finally getting home in the span of those panels. In my opinion my comic is better if it’s in digital form just because it looks much more crispy than if it were to be printed. As for the ideal environment to read my comic it would honestly be anywhere, any time it doesn’t matter it’s up to the readers choice. I hope the readers just don’t judge it that hard and look at it as attempt to do a comic for a first time Adobe Illustrator user. Much like Photoshop I am not proficient in Illustrator or any of the Adobe applications in fact. I’ve just been trying my best to create a nice, simple comic, for art isn’t really my thing it never has been all of my life but regardless I’ve tried my best. That’s why I hope my project won’t get judged too hard and instead it’s critiqued fairly knowing now that I am not very good with Illustrator.